Since my last post, which was just before Christmas, I've worked extensively for two very cool new clients and other very cool current clients, seen the Austin school district undergo a massive budget crisis which resulted in the threat of my son's fantastic public school being closed, lost myself in the ensuing drama, pulled myself back out with the help of good friends, and finally gotten back to sewing and life in general. 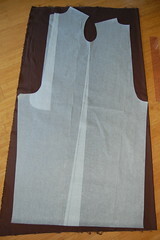 I found a thin, medium-brown cotton twill from Hancock's and bought what was left -- about 1 1/2 yards. Not sure why I forgot my son has grown since last year and that I'd probably need more than that. 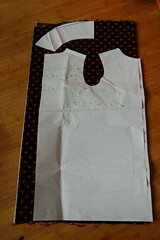 I just eked out the main pattern piece, and nothing substantial was left for the hood. Back to Hancock's I went at the last minute, though they only had a dark brown. But when that's all you've got, that's what you get. BTW I have a new sewing injury to add to my repertoire: pulling the monkey tail inside out, I lost grip on the tail and banged my forearm on a closet door! At the time, I thought it would be a little knot, but it turned into a huge knot and awful-looking bruise. Much better now, a week later. I'm laughing that I didn't even take a picture of Louis in the suit when it was done. Oh well, he will wear it again and I can photograph it then. I look forward to easing back into Blogland, seeing what you've been up to. Thanks for sticking around and reading while life deals its bit and I roll with the punches. Hi Antoinette!! So good to see you back! The dress? Genius. Seriously. There are some super mod prints out there this spring, and all would look great! Spring has sprung up here in north Texas; we're sneezing our heads off. that dress is so sweet! and kite flying - you're making me wish for spring up here. I love piping, I love 60's style dresses and I love dresses that can be worn as tops. Very clever with the one seam goal, clever girl! 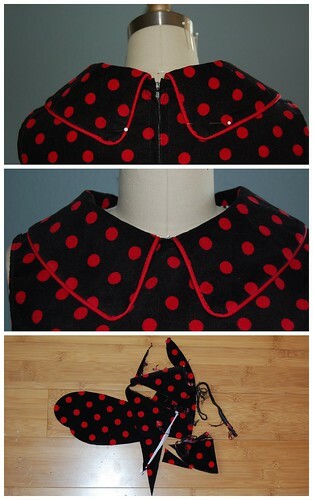 The red piped collar really makes that dress!! Love the reverse ladybug! Sorry to hear about your sewing injury. Hope it improves every day! Very cute! We were at the Kite Festival too! (along with 30,000 others :)) Too bad we didn't run into you! so cute! i love the polka dots and the cut of the dress. Wow, that is a neat trick! Do we get to see the Curious George costume? so glad to see you back--skinnifying jeans, curious george costumes, and reverse ladybugs, oh my! I love how that dress turned out, very awesome. I'm in catch up mode in blogland. Your dress is perfect for having fun in. 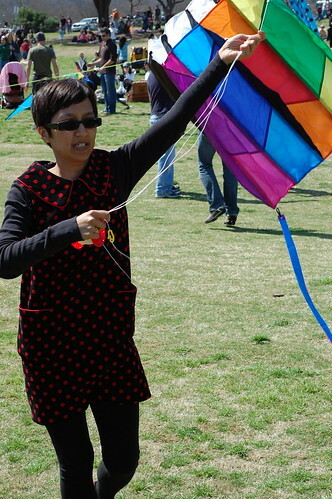 You and Lewis must come to Sydney and fly your kites at the Festival of the Winds on Bondi. Welcome back! Great dress and can't wait to see the monkey suit! :) I know what you mean about the school drama... we had our own since my husband's a RR school teacher. Hope to see you soon! welcome back! how awful about the school -the world truly is going mad. love the dress. 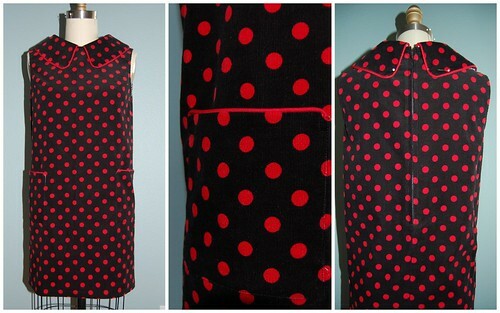 What a beautiful mod dress..love the polka dot, so cute..love it!